We offer pet dental services in our veterinary office. It is estimated that 70% of cats and 80% of dogs exhibit the beginning stages of periodontal disease by age 2, which is why dental exams and teeth cleanings are essential. Toy breed dogs are estimated that 90% exhibit periodontal disease by age 1! Also, studies indicate that pets with good oral hygiene tend to live 2 to 4 years longer than pets who neglect dental care. While periodontal disease is entirely preventable, when left untreated it can lead to cardiac disease, kidney infection, liver infection, or stroke. Pets can experience many of the same dental issues that humans do, including gingivitis, periodontal disease and damaged or broken teeth. Regular dental exams and cleanings can help you avoid the costliness of involved dental procedures and can help prevent your pet from unnecessary suffering. Pet dental exams are similar to human dental exams with the understanding that discomfort, fear or pain may prevent detailed examination of some teeth without sedation. We do offer free dental estimates, where we examine the teeth while your pet is awake and provide you with a written estimate of the proposed treatment plan. Why does my pet need a estimate for a dental? In order to accurately access the status of your pets teeth and determine the level of effort that needs to be done, we need to see your pet. We need to look inside your pets mouth and see the level of tartar present. We need to see the color of your pets gum line and see how many teeth are present, healthy and if any are damaged. If your pet is senior pet or has advanced dental concerns, we might require blood work and a EKG to ensure that your pet is healthy enough to have a dental performed. Antibiotics might be prescribed before, during and or after your pets dental. All of these factors can increase the cost to you and we never like for you to make a decision without being fully informed. What is a Dental Prophylaxis/Cleaning ? A general anesthetic is administered and your pet is monitored for heart rate, blood pressure, body temperature and oxygen levels during the dental. One staff members are trained to this task. We then do detailed examination of all aspects of each tooth, above and below the gumline and dental X-rays. Dental x-rays permit us to look for potential cavities, accesses, root fragments, jaw damage, and other underlying conditions that might exist. If more unknown serious conditions are discovered, tooth extraction, etc. might be required. We will always attempt to contact you to advise you of any changes in the treatment plan before proceeding. We record/chart the status of each tooth to allow us to accurately track your pets dental health over it's life. During your pet’s teeth cleaning, we will gently clean the surface of each tooth, with an ultrasonic scaler that cleans; by using the vibration of sound waves and water. The waves push the water creating tiny scrubbing bubbles that implode on tooth surfaces and kill microbes as they separate plaque from the tooth structure. After scaling the teeth, we lightly buff and polish your pet’s teeth to complete their dental cleaning, creating a smooth clean tooth surface making it more difficult for tartar and plaque to build up. 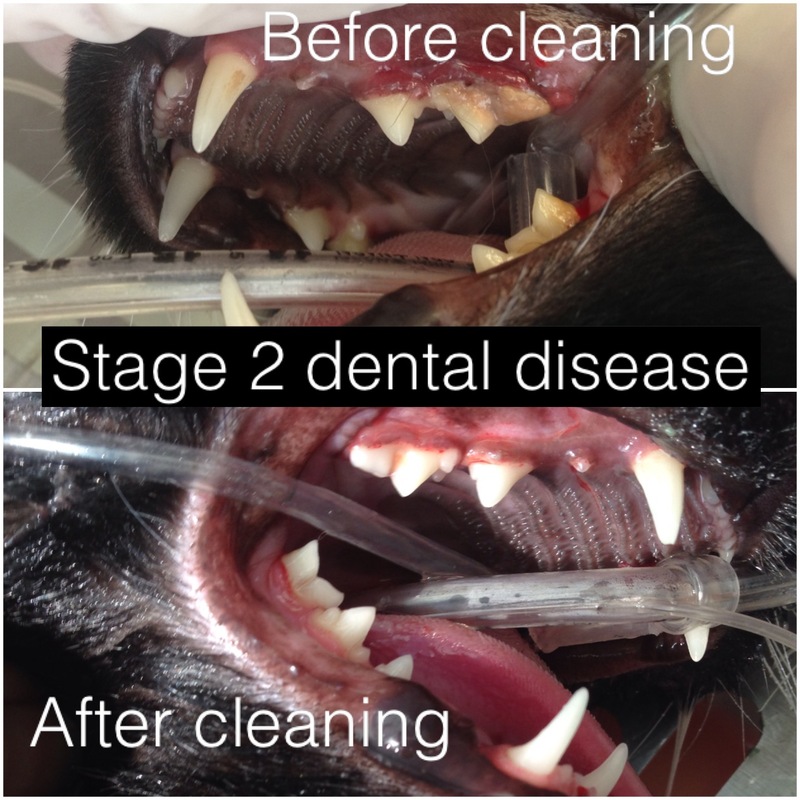 After the cleaning, we will provide you with a comprehensive analysis of your pet’s oral health. You will receive at-home oral hygiene tips specific to your pet. What is Oral Surgery ? When a tooth is damaged, such as a fractured or broken, a extraction may be recommended. There is a risk for infection and many times the nerves are still present and active in damaged teeth. We need to surgically remove the remaining portion of the damaged tooth and clean and suture the remaining space. This is considered oral surgery and is above and beyond the dental prophylaxis. We will include a low and high estimate time in our estimates and never charge for more than we actually do. Dental products specifically designed for pets, including Oravet, can help protect gums and lessen tartar. There are specialized dental care foods that support dental health. If you would like to schedule a FREE professional dental estimate for your pet, call our office to schedule an appointment, and allow your pet to experience a healthy smile!